This lovely wildflower closely resembles the cyclamen (because they both have reflexed petals) with which we are more familiar in Europe. It is a member of the Primrose family, although it does not appear to bear much resemblance to other kinds of primroses - but then neither do cyclamen, which are members of the same family. The flowers have a pointed centre-part comprising fused stamens. Pollinating insects must force their tongues into the centre of the stamens in order to find the nectar, which is their reward for such hard work. Once pollinated, the flowers change their drooping habit and point upwards. The range of this lovely wildflower is throughout the western mountains of North America, and we have seen it in both Yellowstone National Park and in the Rocky Mountain National Park. 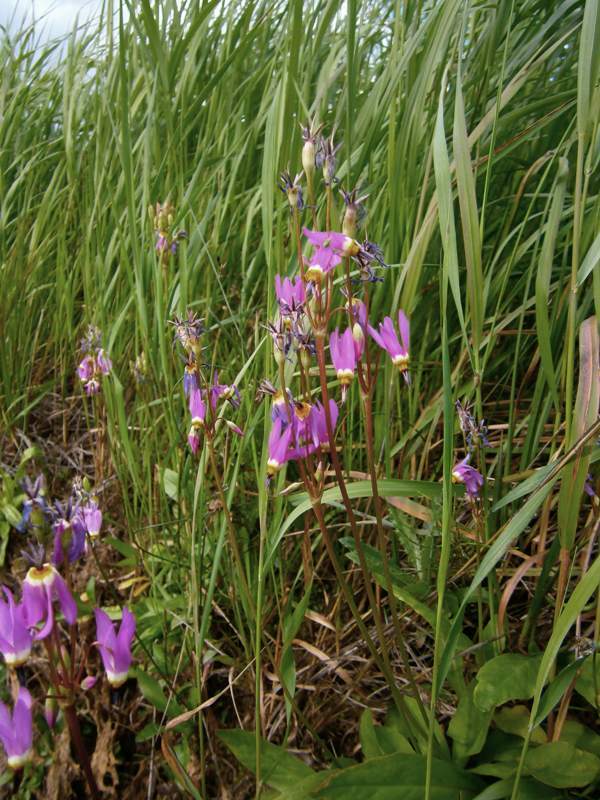 Few-flowered Shooting Star blooms from June until September; it grows in damp meadows, and partcularly along stream banks.